This is so hard for me to do, but I feel like I need to in order to potentially save even just one Mother from the absolute heartache and devastation I’m going through. On July 25th, I laid my beautiful newborn daughter to rest. I never imagined in a million years that something like this would ever happen to me or my family. You go through life with this false sense that you’re safe, nothing like that could ever happen to you. Oh, how I miss that naivety and blissful innocence! My husband and I were expecting our fourth child, a girl! I was 39 weeks and we were all anxious to meet our new little one! I had never had any complications with any of my previous pregnancies and was confident nothing could go wrong. Here I was 39 weeks with a healthy active baby wiggling in my belly just waiting for her to make her debut! I was scheduled to be induced July 27th but sadly we didn’t make it to then. . . July 22nd at about 10am I was concerned she wasn’t moving as much and tried to get her to move. It took a little longer than usual but eventually she did kick me and I was satisfied thinking I’d been having regular contractions, she’s probably just resting up because she’ll be coming soon. By 5:30pm we decided to head to the hospital. I was having contractions that were progressing in strength and about 2 mins apart, but they weren’t really bad so I wasn’t sure if it really was time. We headed over anyways and were excited that this may be it! We may finally get to meet this little girl! When we arrived at the hospital my contractions were getting stronger and I knew this was it! I was so excited! As the nurses were prepping me they were putting the fetal monitor on and were having a hard time finding her heartbeat. As soon as I didn’t hear anything I knew it wasn’t good, but the nurses tried to reassure me that sometimes they get dropped and don’t work right or the baby is just positioned wrong. So they tried another and still nothing. They ordered an ultrasound and that was literally the longest 30mins of my life waiting for him to come. I was so scared but still clinging to the hope that everything was fine, it had to be! Nothing awful like that would happen to us! Well he finally came and everyone in the room was so quiet and no one would say what was going on. I asked “Is my baby OK?” The next words from the sonographer will haunt me for the rest of my life. “...No...” He said. The pain I felt in that moment I would never wish upon anyone. It’s indescribable knowing your sweet baby is gone and you still have to go through the labor knowing the only cries you’ll hear are your own. I wanted to die in that moment and I was so angry! I pleaded with God to make them be wrong she was fine! But by 10:30pm my sweet little angel, Brielle, was born sleeping. She was perfect, 8 lbs, 4 oz. of just pure perfection. Literally the most beautiful baby I’ve ever seen. My world came crashing down in an instant and I will never be the same because of this. 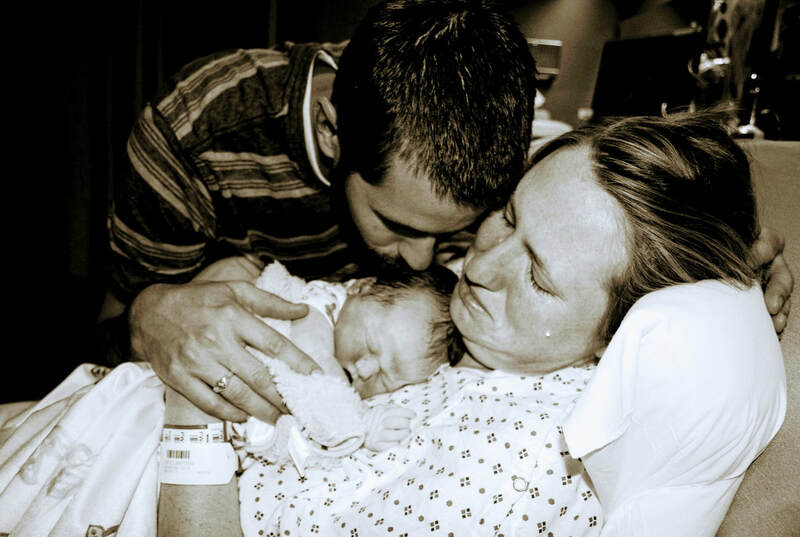 When I delivered my placenta there was a 6cm Hematoma at the base of the cord so we assumed at the hospital that it was a blood clot that just happened. A week later we received the results of the autopsy of the placenta and it had been infected with Group B Strep or GBS which caused the blood clot. What I now know is that my little Brielle most likely would have been very ill had she survived. About 1/3 of pregnant women carry the bacteria and it’s harmless to adults, but can have devastating consequences for infants. Doctors in the United States routinely check pregnant women in the 36th week of pregnancy to administer antibiotics during labor. I had tested positive this pregnancy, and when my Doctor told me I was all she said was, “Oh did I tell you your GBS test came back positive?” I had tested positive with my other daughter and negative with my two boys so I wasn’t too concerned. There really wasn’t any information on what would be done about it given to me. I trusted her to know what was best and didn’t think it was a big deal. The next appointment about 5 days before Brielle died I went in and she offered to strip my membranes. I said sure why not, not knowing the risks involved with potentially introducing the bacteria into my uterus. Now we have no way of knowing that is what caused it, but I wish I didn’t have to live with this regret that I let her do that to me and if I had just been a little more patient and let my body do its thing the end result may have been different. The what if’s and wish I had done’s will never go away and I have to live with that somehow. I wish for my daughter, I had done some research; I wish for my daughter, I would have listened to my body more when I didn’t feel good and I just chalked it up to pregnancy and hot summer days. Her death was preventable, something as simple as antibiotics could have saved her! I’ve been told many times how “rare” GBS is and especially my case where it was able to cross intact membranes. Those statistics, numbers mean absolutely nothing to me! It’s like telling someone just after they were struck with lighting that "Oh, the chances of this happening again are like one in a million" and you’re left standing there thinking, “Thank you?? ?” This is the type of thing you don’t want to be the one in a million or thousand or hundred. GBS stole something so precious to me… It stole my daughter, it stole my innocence and bliss of future pregnancies if there are any. It stole me… I will never ever be the same after this and I look at pictures of us before it all happened and how I long to be that girl again. No one wants to know what this feels like, please share with your pregnant friends and family what I had to learn the hard way. GBS is a HUGE deal! The photo I’m sharing says it a million times better than how I’ve tried to explain what GBS does to families… This is hard to share, It’s me and my husband at our most vulnerable, but I think it captures the pain so beautifully. Please, please don’t be afraid to share information about GBS I know some people are afraid they would scare a pregnant woman with this story or information, but knowledge is power! If it helps even just one woman make an informed decision that could potentially save herself from this horrible thing than it’s worth it to me!